Portland has a new late night food option. Offering “Just good Italian food” and some of the most enthusiastic service I’ve seen after 1am, the Exchange Street Cafe is open until 2AM Thursday-Saturday, making it a new option for post-rock show snacking (yes, they’re open other times too). 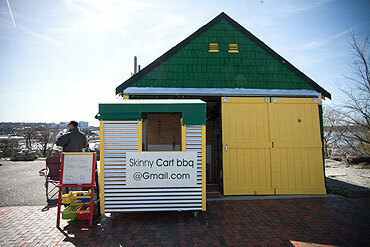 Opening almost two months ago was the Skinny Cart BBQ at 202 Washington Ave. While I was off in Austin consuming as much BBQ as I could possibly find, Portland was getting its own fill of some delicious new smoked, grilled, and messy meats. 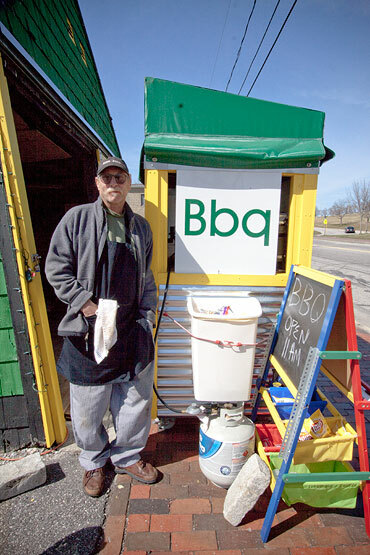 Ron Gan opened the cart in the bright green shack next to his house and plans to add more mobile carts to his arsenal before too long. 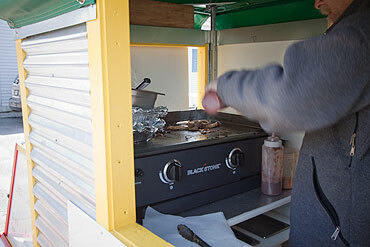 From one friend who hadn’t yet tried the food, it “looked legit.” I knew what he meant before even laying eyes on it – as many foods go, especially of the barbecue variety – the more dilapidated the restaurant/cart/truck looks, the more delicious the food is. As it turns out, this theory holds true with Skinny Cart. The menu is very limited – to just two items, in fact. Their names seem to change, but basically you can either get a beef or pork sandwich. 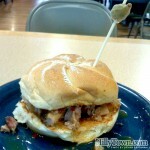 On this trip I had the pork – listed that day as “pulled pork” though what ended up on the bun was less the stringy stuff and more full chunks of shoulder pork, which is fine by me! I was surprised on my first bite (through some tangy peppers and onions on top) when I felt the crunch of – yes, here it comes, folks – bacon! Full, tasty, crispy strips of bacon inside the pork sandwich. Perfect! While there’s no proper seating to rest while you enjoy your meal (I recommend stopping by on a bike trip, it’ll make you justify the meaty goodness if you’re one of those calorie-conscious people – I’m not) though there are some concrete blocks by the driveway which provide a partial view of the city. Hours are 11am-3pm (I think…) most days. 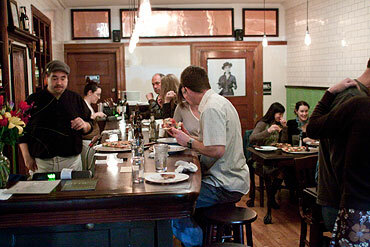 In other food news, my favorite pizza joint in town, Otto, is growing up a bit. 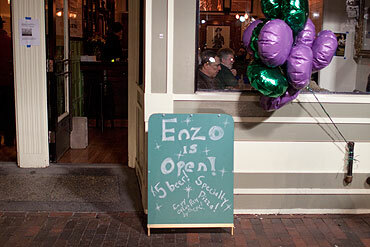 The owners have opened Enzo next door. The beer-and-wine bar has table where you can order drinks and full pies from next door, which are passed through a pizza-sized window in the wall. Finally, in what will certainly be even more of a bummer in the summer, when cheap hot dogs and onion rings are what you want at 2 am, Papaya King on Dana Street is long gone. Oh well, it was good while it lasted. 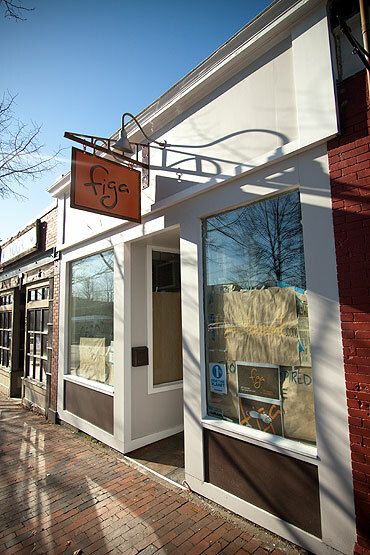 I noticed that the new Figa Restaurant on Congress Street has a sign up and it looks like the interior is coming along nicely, with chairs and other furniture in place… but when is the opening? If you know, please share! In other food news, the Phoenix recently featured my favorite pizza joint, Otto (who appear to have a fancy new website!). Now that the air has cooled I find myself turning to that old breakfast standby: oatmeal. Such simple food, yet so nourishing, so satisfying. Amazing how a few centsâ€™ worth of oats will tide you over until lunch, even if you have a busy morning and lots of leaves to rake. 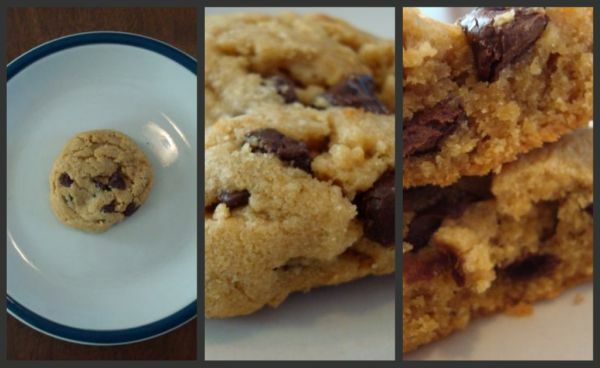 However, in my mind, there is a clear distinction between a chocolate-chip cookie and an oatmeal chocolate-chip cookie. Oats lend sturdiness, texture, and yes â€“ flavor. Oats in a CCC arenâ€™t an â€˜add-in.â€™ Theyâ€™re a revision (OCCC). 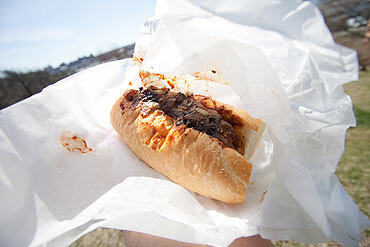 Mind you, it can be a tasty revision, as this OCCC from Big Sky proves. Butter fans, take note! Real creamery taste shines in this cookie, and thereâ€™s just enough salt to cut the rich sweetness. Big Sky is, of course, known for its breads â€“ the Honey Whole Wheat is a staple of the Wakefield household â€“ and while it seems odd to say this, itâ€™s possible to detect the quality flour in Big Skyâ€™s cookie. 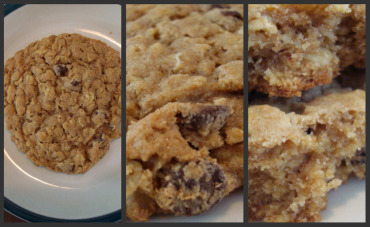 Itâ€™s oaty, yes, but wheaty too; Iâ€™d be curious to taste a version of this cookie sans oats, just for comparisonâ€™s sake. Walnut fans, also take note! I do not, for the record, prefer walnuts in my cookies. But these are fresh and flavorful, lacking the bitter tang that plagues cheap (or aged) nuts. As for the chocolate, itâ€™s dark and assertive enough to mingle with all these other flavors, though I wish thereâ€™d been more of it. I say that, though. What really grabbed me about this cookie, and what Iâ€™m remembering now as I write about it, is the phenomenal, comforting, homey taste and mouthfeel of the grains surrounding said chocolate. I guess this is the only cookie thatâ€™s ever made me crave a bowl of oatmeal. I mean this as a great compliment. 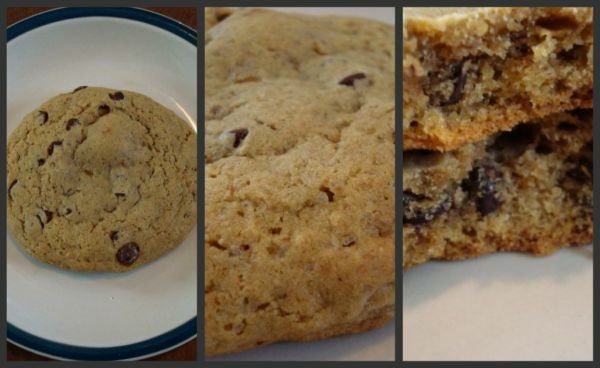 I realize that Bryan, Hilly Town’s owner, asked me to review chocolate-chip cookies for this fine web site. I am sorry that my CCC reviews have slowed of late — the summer was busy, my garden was suffering, and other obligations interfered. I promise I will have more cookies to discuss with you soon but first, a brief detour into the world of the savory. As I have mentioned previously, Mr. Wakefield’s boat business takes him occasionally to New York City. 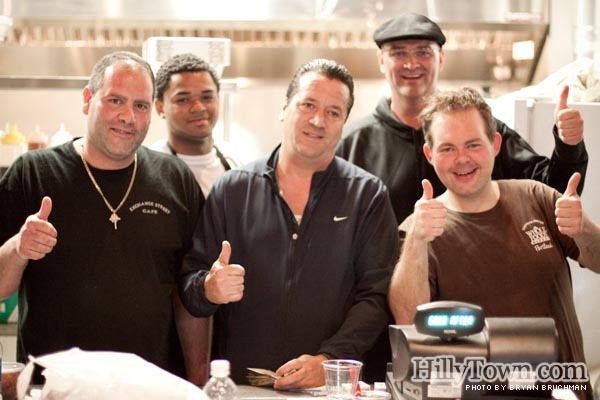 I accompanied him on a recent trip and while we were there we decided to visit Luke’s Lobster, a new spot run by a man whose family is from Cape Elizabeth. 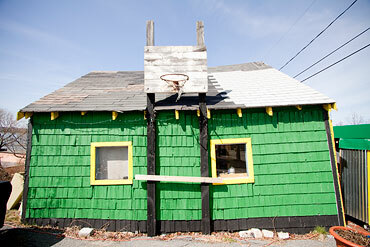 According to the New Yorkers, this place guaranteed a “real” Maine lobster roll at a reasonable price. I hear this is something of a rarity in New York, those poor souls! But is this “real” lobster roll really real, and is the price reasonably reasonable? Only one way to find out. Below the jump, you will see the results of my investigation. My apologies. I forgot the price. Two years ago I joined my husband on a trip to New York City, where he was attending a boat sales show, and there I encountered a chocolate chip cookie unlike any Iâ€™d ever eaten. It was at the Levain Bakery, which my daughter Kathy tells me is â€œfamousâ€ from mentions on the Food TV Network. 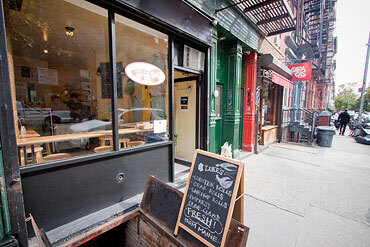 The place was recommended to me by someone at the conference, who said I â€œabsolutely had to tryâ€ the Levain cookie, even though it meant riding the subway alone and getting lost. As I wandered around in circles I found myself envying the pigeons, what with their homing brains. 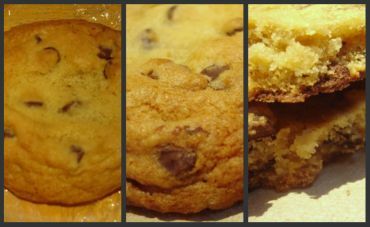 Finally I homed in on the bakery and a â€œfamousâ€ â€œmust-tryâ€ chocolate chip cookie was mine â€“ and just as everything in New York seemed overly large and hard to digest, this cookie was a whopper. I could only eat half, but oh, what a half it was: massively thick, underbaked in the center, with sturdy outsides and a heady rush of sugar. I have since dreamt of this cookie, which Mr. Wakefield liked also when I shared a piece back at the hotel. The reason for this preface is that The Udder Placeâ€™s chocolate chip cookie was reminiscent of Levainâ€™s, if a lot smaller and less intense. When I broke it in half the thick bottom crust bent, it didnâ€™t snap;the insides were soft and doughy. This is my preferred CCC texture but I realize it may not be yours. As at Levain, there was no pronounced vanilla flavor â€“ cheap extracts have ruined many a fine cookie. Instead, the experience was one of light caramel, almost like eating a blondie. The chocolate involved was quality semi-sweet, but in my opinion the chip-to-dough ratio was a mite low. The cookie itself was also greasier than it should have been, leaving visible oily stains on the napkin. A little less fat and a little more chocolate and this would have been a contender for the top chocolate chip cookie in Portland. Best of all I did not have to ride a bus or the subway in order to get it, although it does require a short drive from the peninsula, which I did not mind because I had some spare time that morning. Fellow gardeners know, all too well, the expression â€œThe bloom is off the rose.â€ Comes a day when the air chills, the sky darkens, and your hard-tended beds let faded petals fall to the ground. Is it sad? Yes, a little. But we know this is Mother Nature taking her course. Beauty will spring again in the spring, which is why we call it spring. Chocolate-chip cookies are another matter. Their life cycle is short and pronounced: one day past their prime and they may be downright inedible, which is nothing but a tragedy of poor planning. You should have gotten to them sooner. I thought about this rule when the young man at Hilltop informed me that the cookie I was about to consume was â€œday old,â€ even though he assured me it was â€œstill pretty great.â€ He seemed trustworthy and I wanted to believe him. This specimen was small, about two inches across, and closely resembled the cookies I make in my own kitchen. It was, I realized upon first bite, a peanut butter chocolate chip cookie. My assignment with this project was to review chocolate chip cookies, but purists â€“ like chocolate chip cookies â€“ are best dunked in a cold glass of milk. Onward! Hilltopâ€™s PBCCC contained a goodly amount of salt, which suits my personal taste, and despite its age the insides were wonderfully soft and chewy. However, the bottom was greasy and the edges ever so slightly sandy, two minor design flaws that I will blame on the peanut butter. And peanut butter, as you know, is delicious, as long as you are not one of those poor people who is allergic. chips. I do feel this cookie would have been exceptional if it had contained a slightly higher chip-to-dough ratio. Or perhaps it would have been exceptional if I had gotten to it sooner. But the day previously I had been busy in my garden, with no time to purchase cookies, so there you have it. The North Star is located at 225 Congress Street in Portland. Look for the next cookie review here next week!